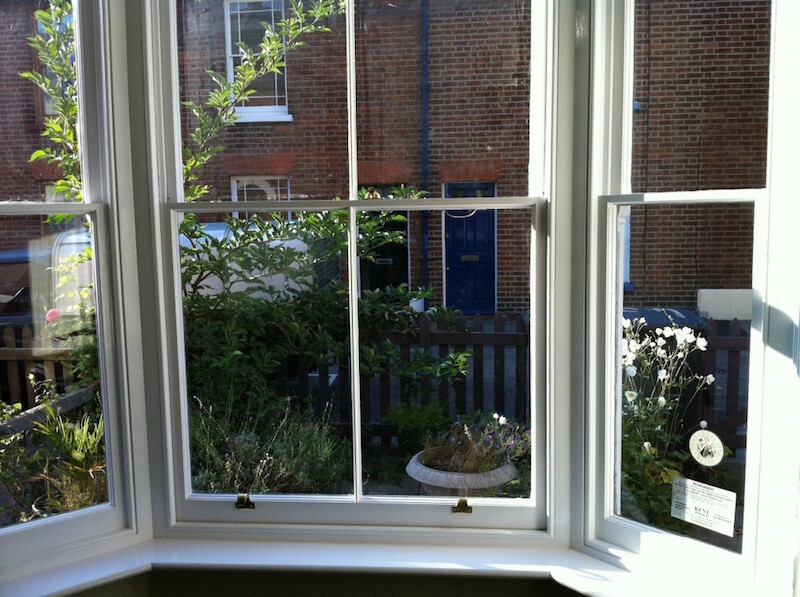 London Sash Window Repairs Ltd offer a full sash window restoration and refurbishment service. We conduct sash window repair before considering costly replacement and renovate more than 99% of windows we quote on. It is extremely rare that sash window repair is not economically viable, in fact we have effected the most complicated sash window repairs that are documented anywhere online today. You can take a look at these in the listed building and conservation sash window repair section. 1. A quality sash window company to install with correct technique, ensuring all wood decay fungus is removed and treated. 2. The window must then be decorated and sealed properly to fully ensure water cannot penetrate the timber again. There’s no hidden factors here, if the two points above are satisfied your sash windows will never rot and further to this even if you don’t maintain or even decorate after we’ve restored, leaving sash window repairs exposed, they would still last our five year guarantee period. That doesn’t mean you should defer decoration, it is important to seal as quickly as possible to ensure maximum lifespan of sash window repair. We also offer a comprehensive renovation service that includes full sash window decoration. Here is a look at how lovely old sash windows can finish. The greatest misconception with sash window repair, and phrase I have hear all too often from new sash window salesman – “you’ll forever be cutting bits of timber out, and filling and repairing, and painting – replacement stops all that”. Does replacement really stop sash window repair? No I am afraid it does not, it simply defers your maintenance period, and if you were concerned by renovation work, you wouldn’t of bought a beautiful period property! Our brand new sash windows, that are high quality and inline with industry standards, will still need a service in fifteen years time. If they are not decorated and maintained after this they will certainly need sash window repair as well. If you are replacing because of noise pollution you might even consider double glazing the original sash windows. In some cases it works out to be 70% cheaper than entire replacement! If sash windows have surface rot or in need of a little care, we would much favour splice repair of the sash over entire replacement. If both methods lead to a quality sash window repair, both jobs are guaranteed for five years and are structurally good, then it makes no sense to remove an original sash and carry out more work than is required. Sash window repair is an efficient way of saving money and keeping your period property features, which is much the fashion I am pleased to say. Sympathetic sash window restoration is a great way of preserving the look and charm of your period property and maintaining authenticity and character. Entire wooden sash window replacement, while beautiful, and maintenance free for ten years, is extremely costly compared to repair, and will never reflect in the value of your property fully. Beautifully decorated, repaired, and draught proof sash windows will not enhance property values, but they certainly will allow you to enjoy fully functioning, and thermally efficient windows as a result of the modern draught proofing technology. The other big plus, when the time comes, the property will be more saleable as a result of flying through the home survey. Sill replacement is offered in soft or hardwood. 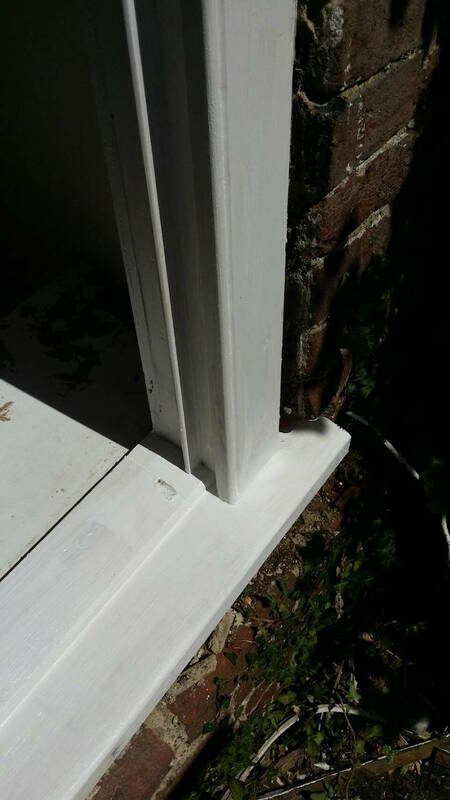 We remove existing sill, splicing styles to house the new sill correctly, rebuild, and leave the window primed and undercoated ready for decoration. Splicing the whole lower section of a window still saves considerable money on an entire replacement window. We treat all window sill replacement with Cuprinol Fiver Star to ensure fungi and bacteria are completely eradicated, resulting in a lasting sash window repair. 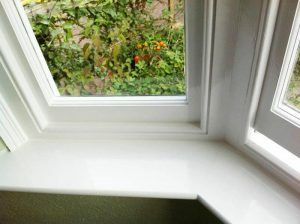 Replacing a sill entirely costs in the region of £120.00 – £240.00 depending on material used and complexity of the repair. Normally a straight forward sill replaced in softwood will attract the lower end of our pricing structure. The example sash window sill replacement below was the lower end of the price range. 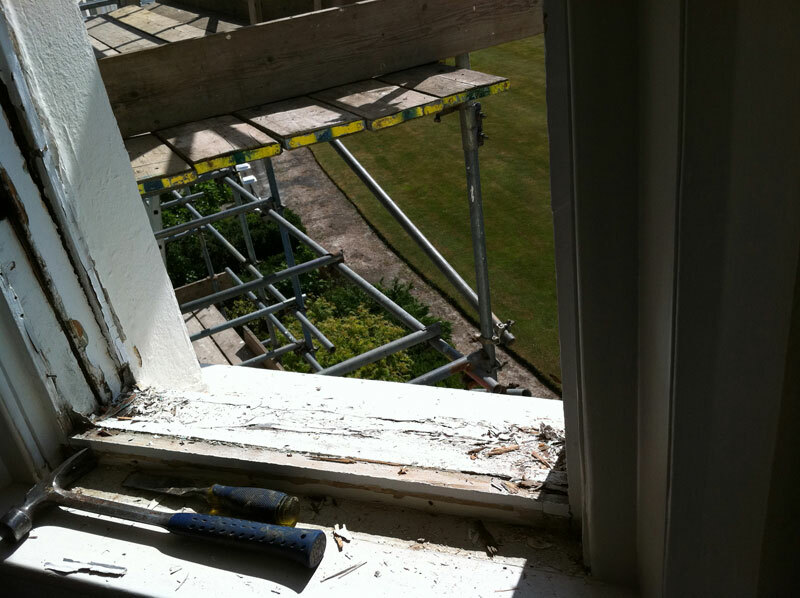 Pictured above: Sash window sill and frame requiring replacement. Sash window sill repaired, primed, and undercoated ready for decoration. 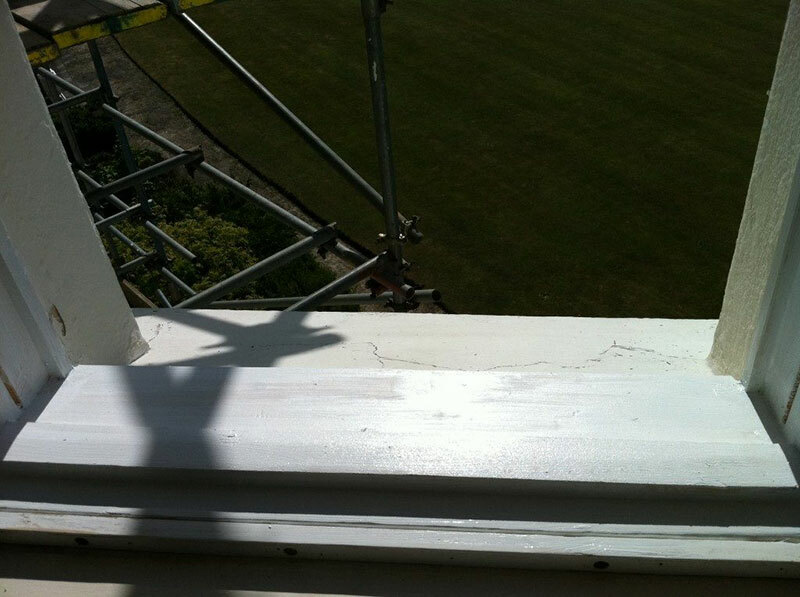 As you can see in the sash window sill before and after, once we’ve finished the repair, there won’t be any visible signs you’ve ever had any work done at all. We splice all timbers at 90 degree angles to ensure water cannot sit, or penetrate repairs easily. The joints are all mechanically fixed and then resin bonded to assist with the timber water proofing process. 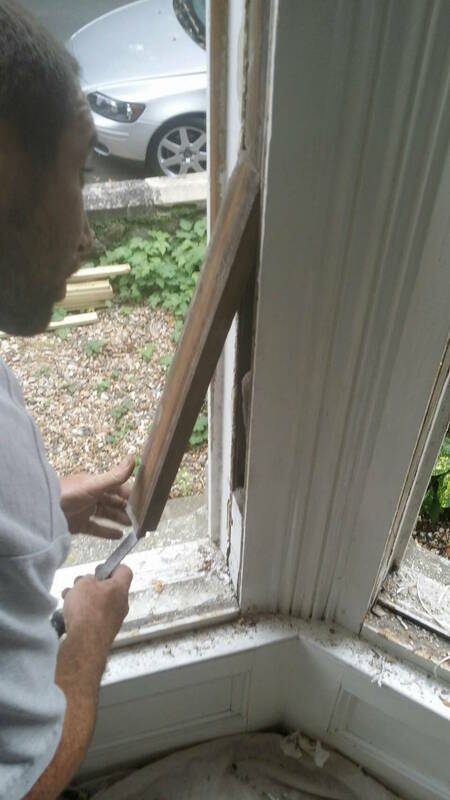 This type of sash window repair is extremely effective and a viable solution prior to considering full replacement. 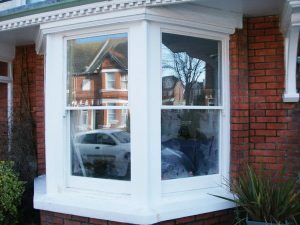 The repair will last as long as it is maintained and moisture cannot penetrate the timber, so with a little decoration every three to five years (the lower end of this scale if south facing) your window is in great shape. 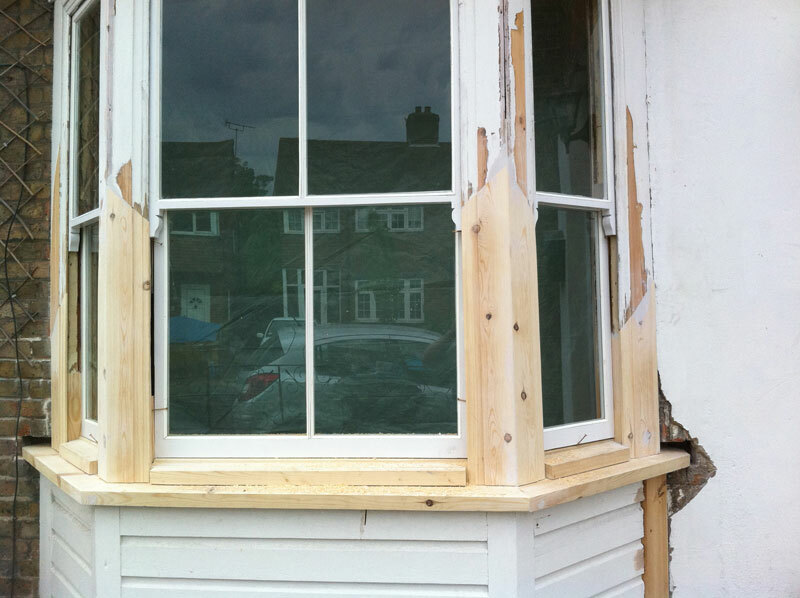 Here’s another example of a sash window sill replacement. Sash windows can be in pretty poor condition before we consider replacement, or it’s no longer economically viable to do so. 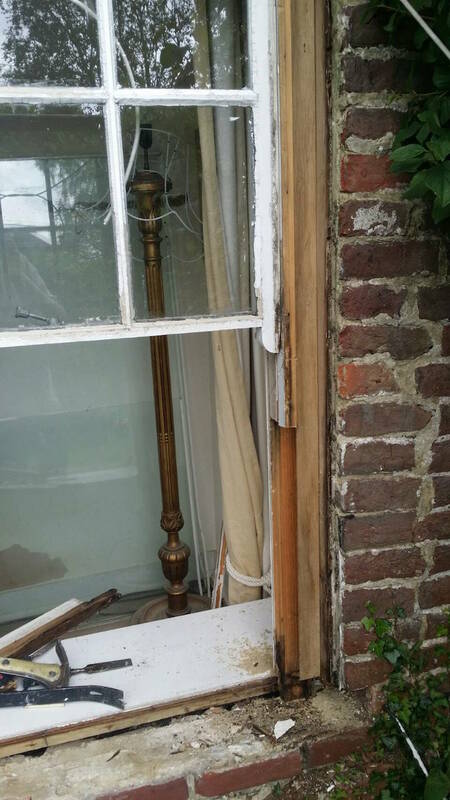 The frame, pulley stile, and sill were all completely rotten and the only long lasting solution was to essentially remove the whole lower third of this sash window. Sash window sill replacement with pulley stile and front cheek required. 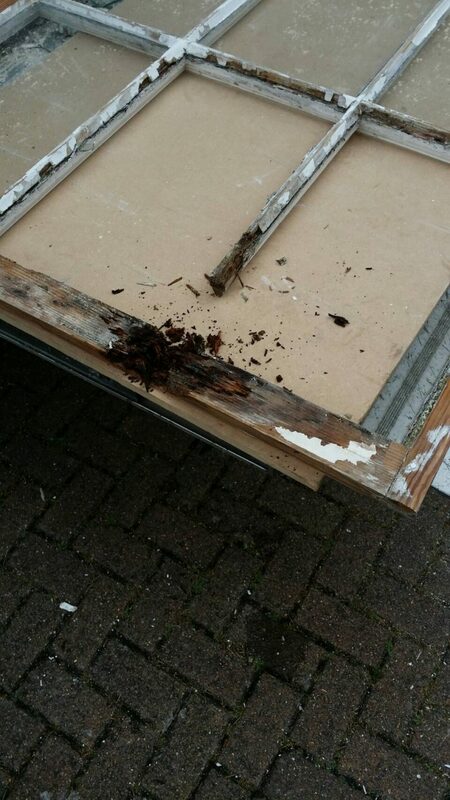 When frames are in this condition it’s also essential that we fully treat the frame reveal to make sure all wood decaying fungi are removed and the rot cannot come back. As you can see below we’ve cut out the lower third of the window entirely in preparation for a new sash window sill, and box frame splices. Now that all rot is exposed we can cut away the inner cheek too. The window is now ready for rebuilding. As you can see below we splice the sill and cheeks together so that the frame regains it’s structural integrity. In this example the client wished to pay for softwood. We would happily quote to effect these repairs in hardwood if you prefer. Once the sill is fully repaired we make good with resin, and then prime all exposed timber leaving the repairs ready for decoration. Please note, any original timber will still require preparation for painting. Once the repairs are primed and undercoated the only job that remains is a little pointing around the brickwork. Normally this isn’t an issue but the sash window sill replacement in question here has a timber sub sill protruding as well. Sill splice – Splicing can be effected when it is more economically viable than entire sill replacement. 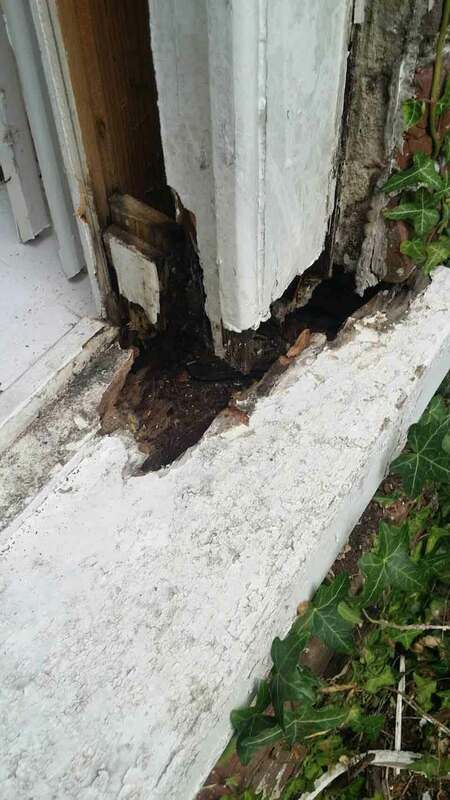 If the front of your sill is rotten only, and we can fully remove all wood decaying fungus, then it’s a good way of effecting a long term repair. Joints must all be resin bonded to ensure to firm fix and no movement. Water will then not be able to protect your timber. In some cases decay may be limited to just a corner of the frame. It might be sensible to effect a quality resin repair in this situation. Bottom, top, and meeting rail replacement can be carried out when a sash is rotten, however the remainder of the sash is in good condition. This is an effective repair that saves considerably on entire replacement of the sash. 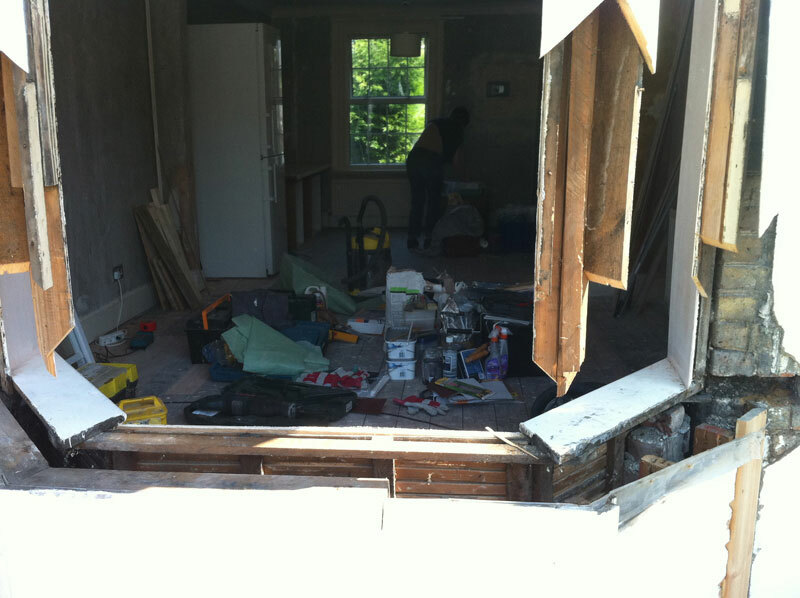 Pictured is a sash window that requires a new lower rail, glazing bar, and two new panes of glass. It is still economically viable to splice repair as the amount of glazing bar in this sash attracts a premium replacement cost. To give you an example we repaired this sash for £160 when the replacement cost was £280. If you’ve got many sash windows in vary states of disrepair then you can save a significant amount of money making good rather than entirely replacing. In this example we will remove the lower rail first, and then take out the glazing bar all the way to the joint. This is the first effective point to bond the glazing bar making it structurally good. Lower sash with a rotten bottom rail spliced back to good timber. Sash Rail replaced with new glazing bar installed and 4mm clear glass. Good as new. A new lower rail is then attached using a mortice and tenon method, the same principal as sash replacement to ensure the sash is structurally good. Glazing bar scribed and fitted. The timber is all treated to make sure no rot can spread further. The joints are then bonded with resin and then sanded. A first coat of primer is then applied. Once dry, another coat is applied to ensure the sash is well sealed. We will then glazed the sash and install draught proofing seals ready for re-installation. 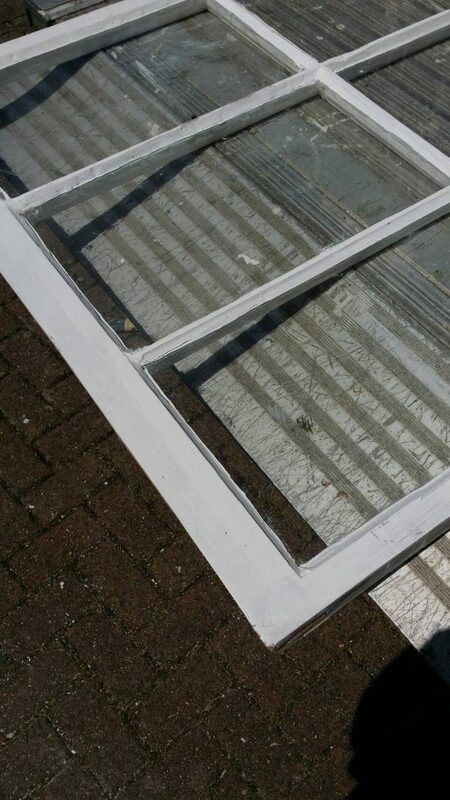 It’s worth mentioning we prime the sash prior to glazing to ensure that if putty fails in the future, the timber will not be exposed, it also should be done this way to ensure that if the glazing requires replacement, the next putty removal will be easier and cause less damage to the sash. 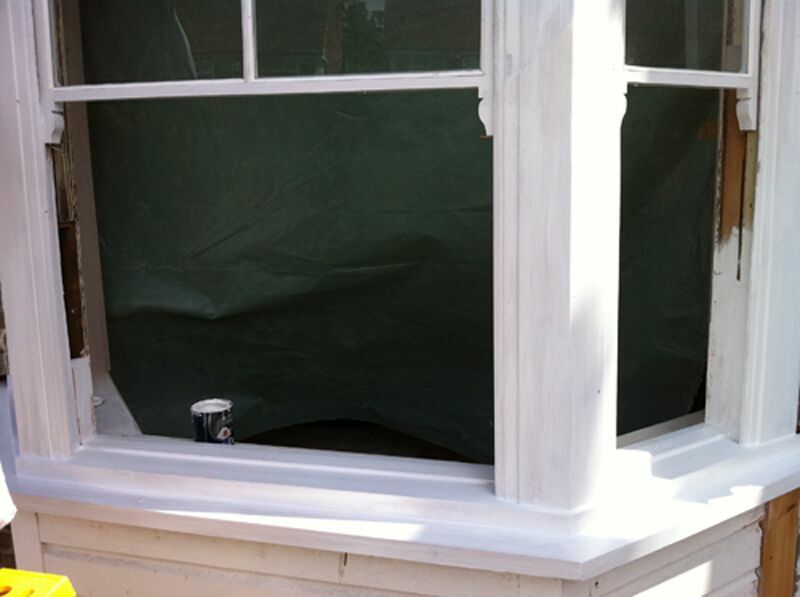 All new sash windows should be primed prior to glazing as a standard. The sash is in good structural condition and will require decoration as soon as is possible to seal the sash repairs from moisture entirely. If the sash is beyond economical sash window repair then the next best hing is replacement of the specific sash that is rotten. 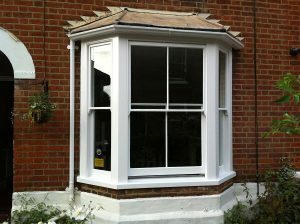 We can supply the sash window in soft or hardwood as well as stained, primed, undercoat, and glossed finished. 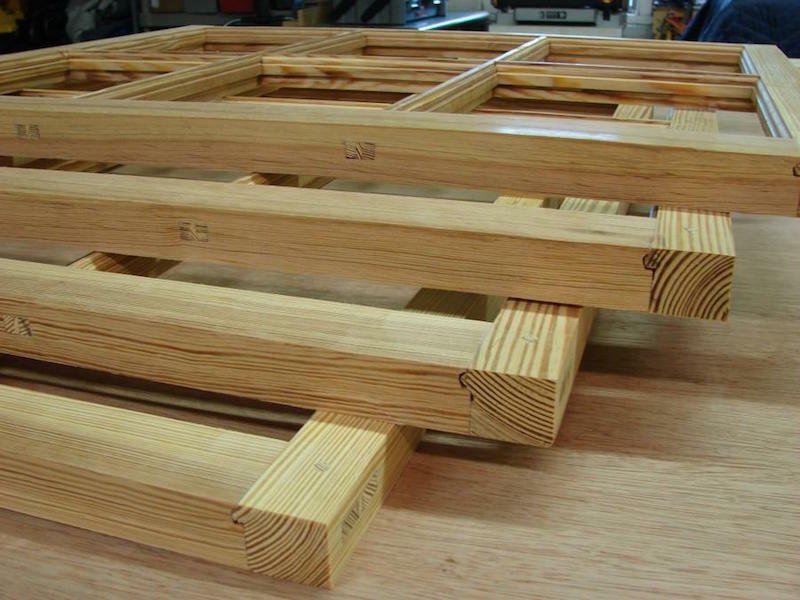 Normally we use Douglas Fir for our sash window replacements as it is a nice quality softwood timber that lasts well in British weather conditions. New sash built using age old joinery techniques designed to last a lifetime. As you can see our joinery is mortice and tenon and professionally scribed. There is no stronger, more durable joining technique, and if there was, rest assured we would use it. When sash cords snap or weights fall off it can be inconvenient closing your sash window especially if the top sash is the issue. Overhauling and replacing sash cords is a relatively simple job, and as a quick fix to secure your home, you might consider screwing the top sash shut – it also prevents any issue of the sash slamming and breaking, sending large shards of glass everywhere. We remove the sashes, and cut all cords. We will then scrape down any loose debris from the frame and sill. Exposed timber will be primed to ensure no water ingress is possible. We then replace these cords and attach weights making sure counterbalance is adjusted to allow optimum travel of your sash window. Normally whilst overhauling we will incorporate a sash window draught proofing system as this doesn’t cost much more and offers significant thermal benefits over a standard service. We normally use existing parting and staff bead if they are not damaged, just cleaning them up, removing any loose or flakey paint. We then rebuild the windows and lubricate with candle wax, an age old solution for smooth sash window function. As part of the service we will then align furniture, or replace if instructed. If your in a conservation area, or your property is listed and planning are insisting on sash window repair then please do contact us. We are specialists in the effective repair of listed building sash windows. Our sympathetic and time proven repair methods will ensure your sash windows are in good health for years to come. We can repair any sash window. If you need a repair, we can do it. On occasion repair can actually nearly match replacement in price(if the repairs are that considerable). In this situation it’s likely planning will grant replacement like for like and we will be able to help with this as well, however it’s a last resort and extremely unlikely to be required. Sash windows that are listed can have a draught proofing system installed as this is hidden and rebated within the sash. As always with a listed building, you must let the planning know as a courtesy, you don’t want to be caught out by them. Bay sash window spliced out back to good timber. The entire lower section of the window needed rebuilding and our client did not have time to wait for planning approval to entirely replace. This presented an interesting challenge, essentially making an ornate sash window on site. Bay sash window rebuilt with all original profiles recreated. Final splices and minor sanding needed to be carried out, the results are a bay window that is now structurally good, and will last as long as maintenance is kept up. Sash window fully rebuilt, primed, and undercoated ready for decoration. We can also now offer various double glazing upgrades due to new technology allowing glazing within original sashes, however this will still need signing off from planning. Normally if you state your intentions to repair your sash windows and leave them exactly like for like then there will not be any paperwork, and if there is it will be minimal as this is exactly the process planning would like you to take. If your only in a conservation area then sash window repair, sash window draught proofing, and double glazing of the original sash will present no planning issues, although we do advise to contact planning regarding double glazing, just to state your intentions. There will not be any rejection as conservation is now on side with double glazing of traditional sash windows as long as in keeping with the original design. Dormer sash windows take a real beating. They are completely exposed to all weather and will be the first windows to suffer from rot and water penetration in your home. You’ll notice wet patches under the sills, causing damage to plaster first. Despite being protected by lead flashing, moisture still finds a way into the sill sections so now it’s advised to have the sill exposed and accept that every summer you need spare an hour to sand the sill and lay a coat of gloss to protect again. It’s an unavoidable uphill battle, decoration needs to be carried out as frequently as every three years as well as the windows almost always being of awkward height in attempt to allow as much light in as possible, and in this situation I do empathise with those that wish to replace with UPVC while I still strongly advocate against it. Normally there is a cost of scaffolding or a Cherry Picker to access the window which isn’t cheap. London Sash Window Repairs Ltd have a solution to decorate your sash window externally without the costly requirement of another service. We will take the sashes out, and decorate them out of situ, we also double down on paint with two undercoats, it’s worth the extra effort in an attempt to get an extra year or two from requiring the service again. Once we are finished your dormer sash window will be structurally good and well maintained. As previously mentioned though, it’s really worth the hour every summer with a coat of paint on the sill and the lower rail of the bottom sash. These areas will be the first to go and it will extend the effective period of decoration considerably. While UPVC may be tempting, I’d urge you to consider the damage to plastic extrusion from direct sunlight. It’s highly unlikely you’ll get useable, maintenance free, windows for more than ten to fifteen years. You might well get a nasty shock of a £2000 reduction in value of your home when a prospective buyer attempts to negotiate the price based on not having original, period sash windows, more if you have more than one window! Resin repairs – epoxy resin is a relatively old product, that’s become popular for sash window repairs in the last fifteen years or so. Initially London Sash Window Repairs Ltd were not advocates of the use of resin. It seemed the use of resin was to take away from skilled splicing and master craftsmen sash window repairs that you can find on this page. 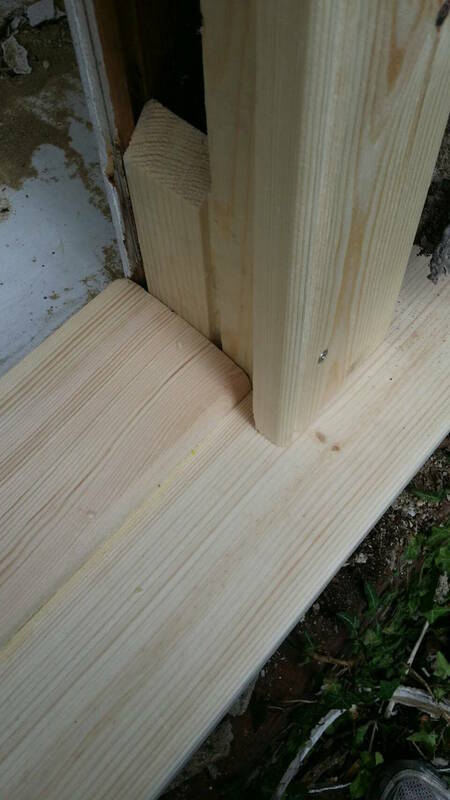 When resin companies updated their correct use guides to incorporate timber splice with resin as a secure bond we were quick to take up the product as the bond between timber is the most important part of a lasting repair. If the resin creates a bond that won’t break, or crack, water will not penetrate. Resin companies suggest the bond between timber and resin is stronger than the timber itself. The example they provide to back this up is pretty acceptable, which I’ve included below. They use a slender piece of timber which is always going to be brittle, however it certainly proves that resin will take the full force of a hammer blow which considerably more force that any weathering conditions likely faced. Resin really becomes effective for sash window repairs when extremely ornate profile replication is required. Timber replication of such profiles are time consuming and costly, resin reduces the overall amount of work, and allows for completion in a timely manner onsite. the resin is completely workable and sands to smooth and accurate finishes well. The normal procedure after resin repairs is to prime, undercoat, and gloss. Re-glazing 4mm, 6mm, laminate safety glass, and toughened – Where glass is broken or the client wishes to upgrade glazing we can help. Glazing is not limited to the mentioned only, we can supply any Pilkington style, type, or texture. Perished putty replacement – When decoration and maintenance is not carried out for a while, putty can perish allowing water ingress behind the glass to the lower rails. This cause decay and spoils internal decoration. We will remove any rot, dry the surface well and prime. We will then re-putty. Priming before puttying acts to serve as an extra layer of protection if the putty does perish in the future. Sealing frames to render using a silicone sealant – This will stop water and draught ingress and generally improve the amount of air that can get into the cavity of the house. It will stop insect infestation as well. Replacement architrave and decorative mouldings – we replace and install architrave. Most windows will have a standard O-Gee profile. We can replace and replicate ornate designs on request.